Tennessee quarterback Jarrett Guarantano looks for a receiver as the Vols attempt a two-point conversion during their game against Georgia in September 2018. KNOXVILLE — Spirits are high around the Tennessee football program this offseason, which has included signing a recruiting class ranked 12th in the nation and adding assistants with successful track records. With that kind of momentum, it's almost as though most forget the Volunteers went 5-7 in 2018, with an average margin of defeat of 25.1 points and six losses by 25 or more points in coach Jeremy Pruitt's first season. Also apparently overlooked for now is that the program is 55-57 this decade, with the Vols likely to be the only Southeastern Conference team to not win at least 10 games in a single season before it's over. The optimism is understandable because everything appears to be trending in the right direction for the Vols under Pruitt. He has brought in quality players. He pried a successful offensive coodinator (Jim Chaney) from rival Georgia, and he also convinced former Vols quarterback Tee Martin to come back as an offensive position coach. Going into next season, he returns a lot of experience and he has been building the sort of depth a team needs to compete in the talent-rich Southeastern Conference. 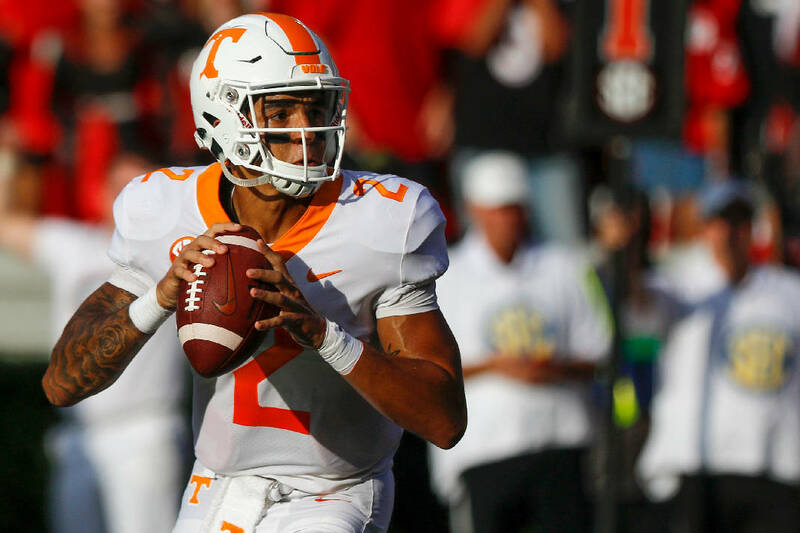 In the first of a two-part series taking a position-by-position look at Tennessee's prospective 2019 roster, the Times Free Press takes a look at the offense. All eyes will be on the development of Jarrett Guarantano. Statistics suggest the 6-foot-4, 207-pounder made impressive strides in his first season as a starter by throwing for 1,907 yards and 12 touchdowns with only three interceptions. At one point, he had thrown a school-record 166 consecutive passes without an interception. There were times he held on to the ball and others in which he chose to check down and not take any chances, but with the exits of one-year rental Keller Chryst, who was a graduate transfer, and Will McBride, who has transferred to Lamar, it appears unlikely Guarantano will enter spring camp with a serious challenger for the starting job. Redshirt freshmen J.T. Shrout and incoming freshman Brian Maurer, who is already on campus, are more likely to battle for the backup job. Coming off a season in which he led the Vols in rushing yards (630) and touchdown runs (four), Ty Chandler is back for his junior season. Injuries limited him in 2018, when he played in all but one game but didn't always look healthy. Tim Jordan added 566 yards on the ground and showed an ability to handle a lion's share of the workload when he rushed for 118 yards on 20 carries after Chandler was injured against West Virginia. The questions loom behind those two. Jeremy Banks could factor in, but it's equally likely the 6-1, 211-pound sophomore moves to linebacker; Pruitt hasn't confirmed on which side of the ball he'll end up. Carlin Fils-aime could have a role, but he struggled last season and lost a key fumble in the loss to Missouri. Incoming freshman Eric Gray, the first three-time Tennessee Mr. Football Award winner, rushed for 7,901 yards and 123 touchdowns in his final three high school seasons at Lausanne. He was an early enrollee who could get on the playing field early, too. This group received a boost when Jauan Jennings, who flirted with entering the NFL draft, decided to return for his senior campaign. He gives the receivers a tough, physical presence with 87 career catches and 10 touchdowns. He's one of three returning starters at his position, with Marquez Callaway (37 catches, 592 yards, two touchdowns in 2018) and junior big-play threat Josh Palmer (23, 484, two) the others. Tyler Byrd has had a few moments, while junior Brandon Johnson has nine career starts and was the Vols' leading receiver in 2017. Pruitt wanted more speed and depth at the position, and did just that by adding Ramel Keyton (6-3, 185) and the speedy Jerrod Means (6-2, 212). Although Pruitt prefers big, physical blockers at the position, his best player currently at tight end, senior Dominick Wood-Anderson, is a solid receiver with 17 catches and a pair of touchdowns in his first season with the program. Eli Wolf, who was the team's second-most experienced tight end, graduated and has announced his transfer to Georgia, leaving junior Austin Pope as the only tight end in the program with a catch as a college player. The Vols brought in a pair of tight ends during the recruiting cycles in Sean Brown and Jackson Lowe, with each 6-5 and at least 240 pounds. Although the Vols return at least four offensive lineman who started last season, the buzz is around the players coming in, led by Wanya Morris and Darnell Wright, a pair of five-star recruits. Morris joins Chris Akporoghene as early enrollees among the offensive line signees. Jackson Lampley and Melvin McBride also signed to give the Vols one of the top O-line classes in the country and help satisfy Pruitt's ambition for the line to get bigger (each signees weighs at least 294 pounds). The unit struggled last season and now loses three-year starter Drew Richmond, who is in the transfer portal, and Chance Hall, who recently had to take a medical retirement. The Vols are unsure about the status of Trey Smith, who after a Freshman All-America season is out indefinitely due to blood clots in his lungs. Back are Brandon Kennedy, their starting center until a knee injury in practice forced him to miss all but one game last year, and Jahmir Johnson, Ryan Johnson, Nathan Niehaus and Marcus Tatum, who each started at least five games last season. Returning players are being asked to get bigger; incoming players are being asked to get stronger.